It's not often that the streets of Los Angeles are filled with shouts of "Thank You!" and "Happy Friday!" but when dozens of LAPD Bike Officers joined hundreds of cyclists on Friday's Critical Mass ride, an amazing thing happened, mass civility broke out and the LAPD set a new standard for respect that drew cheers of support from pedestrians, motorists, and cyclists. Most of all, from the cyclists. LA's Critical Mass ride is a tradition that takes place on the last Friday of the month when cyclists gather at the Wilshire & Western Metro Station, taking to the streets in a leaderless journey that some perceive as a protest ride while others frame it as a social ride. Over the years it has grown in popularity for some while others find the large number of cyclists on the streets disturbing. The LAPD's participation in Friday's Critical Mass ride came with a great deal of apprehension, resulting in oversight from Assistant Chief McCarthy and a meeting at the LAPD Headquarters with members of the cycling community and an agreement that respect and communication were the most powerful opportunities for progress. As cyclists arrived at Hollywood & Western, the sight of dozens of LAPD uniforms had a chilling effect that was quickly dismissed when an officer known as "Red" jumped on a Tall Bike and took a spin around the quad, drawing cheers and breaking the ice. The Olympic Division's Bicycle Officers greeted arriving cyclists with "Thanks for inviting us!" and the die was cast for a great ride that bordered on the surreal. Heading south on Western, the Critical Mass ride stretched for a mile and the sight of bike officers "hosting" the streets of LA confirmed that the City of LA is well on its way to becoming a Great City. While Critical Mass is a group ride that occurs only once a month, it's on a daily basis that cyclists take to the streets of LA and ride alone, an act that typically draws commentary on LA's dangerous traffic. 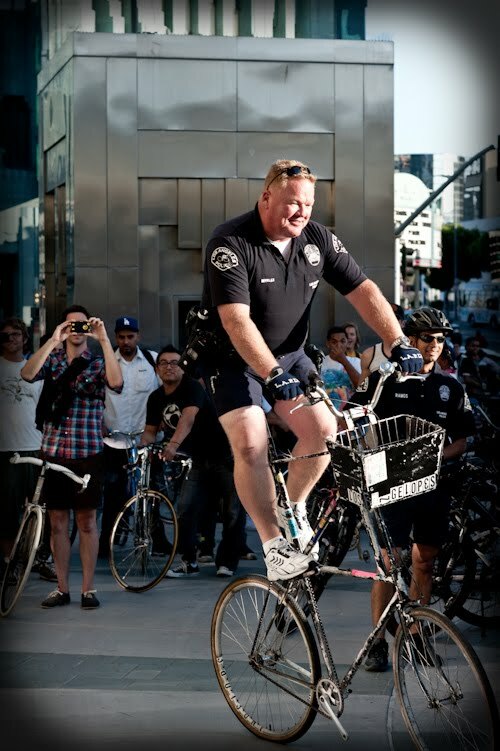 The LAPD's participation in Friday's Critical Mass ride set a new standard for respect, cooperation, and understanding. By joining the cyclists of LA for a ride, the LAPD made huge progress in making the streets safer for everybody, and it all started with a bike ride! This past week, Caltrans hosted two “Understanding Bicycle Transportation” seminars that were attended by bike activists representing illuminateLA, the Bike Writers Collective, Sustainable Streets, the LA Bike Working Group, Bikeside, the OCBC, and CICLE, by municipal planners representing Pasadena, Long Beach, Claremont and San Dimas, and by Caltrans staff including Engineers, Planners, Architects, Environmental and Legal. Missing from the meeting was staff from the LADOT Bikeways Department. While some participants travelled from distant cities by plane, train, and automobile, staying overnight in hotels, the LADOT staff would simply have to walk downstairs from their 9th floor office in the same building. But they didn’t. 1) Sharrows should be positioned in relation to the travel lane to the left, not the curb line to the right. 2) Sharrows should be positioned (default placement) between the tire tracks of motor vehicle traffic in order to indicate a lane control position and to increase life of the Sharrows. 3) Sharrows must be placed so that they both discourage too-close-in-lane passing by motorists and door-zone (<13’ from the curb) riding by cyclists. 1) If a motor vehicle traveling in a straight line in the travel lane and a cyclist riding a meandering line of Sharrows placed a consistent distance from the curbline of a variable width street were to collide, the motorist would have right-of-way. Aftert all, the cyclist would be "merging traffic" and would be at fault. 2) Sharrows should be placed so that the cyclist using the Sharrows as a guide for lane position ends up in control of the lane, not in an inferior right-of-way (ROW) position that engineers conflict. Meanwhile, back on the streets of Los Angeles, there are three issues with LA’s pilot Sharrows project that need to be addressed by the LADOT’s Bikeways Department. Requests for clarification and adjustment have elicited evasive responses that do not resolve the simple engineering dilemma. b) To position cyclists in a lane control position on a non-sharable (<14”) lane. c) To clearly communicate to road users the correct lane control position for cyclists. a) The Sharrows are consistently placed 12’ from the curbline, even on a street of variable width. b) The Sharrows are inconsistently placed at variable distance from each intersection, not based on the distance from the intersection but placed adjacent to the first vehicle parking space. 3) LADOT’s Bikeways Department either has guidelines and a standard for its pilot Sharrows project or it doesn’t. a) If it does, they need to be public and they should be in the hands of LA’s Bicycle Advisory Committee. They also should be in the hands of the public which purportedly will offer feedback on the Sharrows and in the hands of the Neighborhood Councils which monitor the delivery of city services. This is especially true for the East Hollywood Neighborhood Council which actually contributed their money to help fund the Sharrows program. b) If it doesn’t, they need to look to Long Beach and borrow theirs. They need to look to Hermosa Beach and borrow theirs. They need to look to Oakland and borrow theirs. The City of Los Angeles is surrounded by cities who take a short amount of time, prepare a plan, involve the public, and then proceed to do good work, setting standards for excellence and picking up awards and further funding as they go. Why doesn’t the LADOT Bikeways Department simply imitate success. The subject of Sharrows is not new, the science of engineering the Sharrows isn’t new, the California Traffic Control Devices Committee, Chaired by the LADOT’s John Fisher, approved Sharrows on August 12, 2004. To hide behind the “We’re new at this!” is simply an avoidance of responsibility by the LADOT Bikeways Department. 2) LADOT responds that calls for supporting signage are new and isolated. Again, simply not true. When the Santa Monica Boulevard Transit Parkway was being built, the subject of “engineered conflict” came up (2005) and the public requested “Yield to Bikes” (R4-4) signage support but the request was denied. The issue was conflict between cyclists on a through line in the bike lane while the motorists were given an exit lane that merged across the bike lane. (Similar to the westbound lane on Sunset Blvd. in Silver Lake where a through traveling cyclist was taken out by a motorist merging to Griffith Park Blvd. by Triangle Park) The “Yield to Bikes” (R4-4) and “Bicycles May Use Full Lane” (R4-11) signs are old topics and have been rejected over and over. Bicycle lane markings on Class II Bikeways (Bike Lane) should be placed a constant distance from the outside motor vehicle lane. In 2006 this was an issue on Sunset Blvd. where the bike lanes were positioned an equal distance from the curbline, not from the travel lane. The significant variable width of the street resulted in bike lanes that had a meandering relationship to the adjacent travel lane. 4) LADOT responds to comparisons to other cities by feigning ignorance and challenging critics “What cities?” as if they don’t know. If it’s true, it demonstrates a failure of relevance. If it’s not true, it is absolutely unacceptable. Look at the center lane positon supported by the green stripe on the Sharrows in Long Beach. Look to the R4-11 signage support on the Sharros in Hermosa Beach. Look to the Oaklands standard for guidance on how to plan, how to communicate, how to disseminate information so the public, the implementation team, those responsible for evaluating, those responsible for oversight are all in sync. 1) Strict adherence to the “12’ from the curb” position results in Sharrows that sometimes direct cyclists to an incorrect position. a) Fountain westbound past Vermont, the Sharrow puts the cyclist in a right turn lane, setting up a right hook conflict. Engineered Conflict! b) 4th Street westbound approaching Vermont, the Sharrow puts the cyclist in a right turn lane to the right of a through/right turn combo lane. Engineered Conflict! 2) Strict adherence to the “12’ from the curb” position results in Sharrows that meanders while through traffic should follow a straight line. a) Fountain has wb sections where the Sharrows direct cyclists to merge in and out of through traffic. a) Churches and Convalescent homes with loading zones and parking restrictions may not have on-street parking in front but that shouldn’t interfere with the placement of Sharrows “immediately after an intersection” but the LADOT places them at variable distances based on parking. b) This results in variable positioning and a delayed merging action at the rear of the first parked car instead of a simple position clarification immediately after the intersection. Very non-sensitive to the context of the environment. a) It is acutely apparent that the LADOT did not consult with the DWP nor was a survey of water main covers conducted in advance of the Sharrows installation. b) It is acutely apparent that the LADOT’s partnership with the Bureau of Street Services on the Sharrows installation did not include any synchronicity of street resurfacing or maintenance or pothole repair. c) It is acutely apparent that this was not a consideration because the LA City Department actually installing the Sharrows at the direction of the LADOT’s Bikeways Department is the same department responsible for LA’s street maintenance and repair. It is imperative that the LADOT’s Bikeways Department immediately develop and implement a Sharrows Standard, even if only a temporary “pilot project” standard, and that it correctly position the Sharrows based on the travel lane (not the curb), that it correctly position the Sharrows in the lane control position on non-shareable lanes (<14’) and that it clearly communicate (signs and paint) to all road users the correct positon of cyclists on the street. LA's first official Sharrow on Fountain Ave., heading east from Western, directs cyclists toward the first pothole. The rocky road continues because the Sharrows line up with the right tire track of the motor vehicle traffic, typically the most worn area of the street. In the other direction, the first Sharrow on Fountain Ave., heading west from Vermont, places cyclists in the right turn lane, a lane that doesn't continue through the intersection. This sets up the cyclist for a "right-hook" collision and directs them into the back of the upcoming parked cars. Along the way, cyclists enjoy Sharrows that are consistently 12' from the curb but vary in distance from the center line of the street by a distance that ranges from 18' to less than 7' which results in a meandering journey down Sharrow Lane. Making the journey more interesting is the fact that the placement of the Sharrows is not context sensitive, failing to take into account anything other the presence of on-street parking and the distance from the curb. Road conditions? Potholes? Varying intersection treatments? Water Mains? Driveways, parking lots, destinations, human behavior, anything? Nothing! The LADOT's Bikeways Department has committed four significant missteps in the opening moves of LA's nascent Sharrows program. How about some standards! 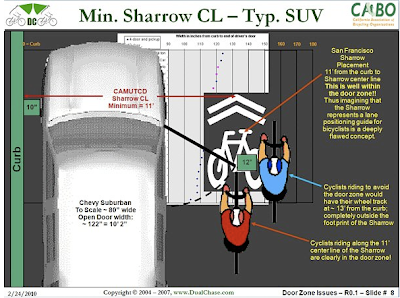 If the purpose of the Sharrows is to move cyclists out of the Door Zone, define the Door Zone and set a standard for the position of the Sharrows based on the stated intent to clear the Door Zone. Here comes a Standard! If the purpose of the Sharrows is to move cyclists to the correct lateral position on a non-sharable (side-by-side) lane, define the correct position and set a standard for the position of the Sharrows based on the stated intent to correctly position the cyclist in the travel lane. Here comes a Standard! If the purpose of the Sharrows is to alert road users within a narrow traveled way of the lateral location where bicyclists ride, one would think that there would be some signage supporting the Sharrows. R4-11 "Bicycles May Use Full Lane signs fit the bill. Here comes a Standard! If the purpose of the Sharrows it to reduce conflict and improve safety on the streets for all road users, define the behavior that is desired and then set a standard. Passing distances? Predictable riding? Here come the Standards! Standards are good for the success of LA's pilot Sharrows project, they are good for the success of the larger commitment to implementing Sharrows throughout LA, they are good for developing project oversight tools, they are good for engaging the community by clearly communicating expectations, and they are good for cyclists and other road users because they offer real tools for evaluating the successful implementation of LA's pilot Sharrows project. Local cyclists look to the City of Long Beach and ask why Los Angeles can't have a Green Shared Lane that serves as "an invitation to ride" but at every turn the answer is "No!" Yet the person responsible for saying "No!" is anonymous, hidden from the public. Now is the time for the LADOT's Bikeways Department to 'fess up and reveal the truthfulness in their rejection of the Green Shared Lane. Who is in charge of the Department of "No!" and why can't Los Angeles have creative and innovative transportation solutions that truly support cycling on the streets of Los Angeles? Why must the LADOT's Bikeways Department consistently resist any effort to move forward with transportation innovations? Why must it be always be a fight to move forward? Local cyclists look to the City of Hermosa Beach and ask why Los Angeles can't have Sharrows in the center of the travel lane supported by signage that reinforces the rights of cyclists to control the lane. The R4-11 sign has been requested by cyclists before but the LADOT's Bikeways Department responds with an unattributed "No!" that serves as a deterrent but comes with no transparency or accountability. 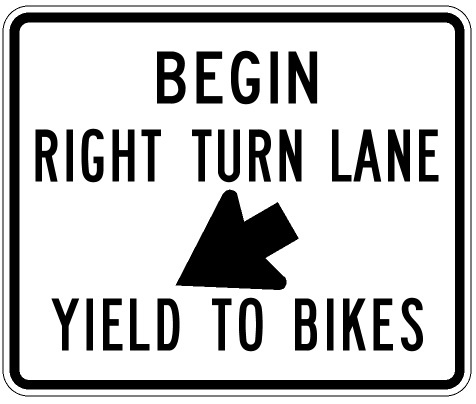 1) develop, implement, and communicate Sharrows standards, with clearly stated goals and expectations. This must be coupled with some form of oversight and accountability. Take a look at Oakland's Sharrow Standards for an example. 2) develop and reveal a clear hierarchy of authority so that the people of Los Angeles know who is in charge, who they must appeal to, who is responsible and who is accountable. The LADOT's Bikeways Department is in charge when convenient, they play victim when it gets heated, they feign helplessness when convenient, and they go missing in action when there is controversy. Who would have thought! Sharrows have the potential to reinforce good behavior for cyclists, good behavior for motorists, and good behavior for bureaucrats. Not bad for simple paint on the streets! The LADOT's Bikeways Department is busy installing Sharrows on Fountain Ave. in East Hollywood, drawing cheers from those who have waited years for any progress and jeers from those who think that years of debate and planning and preparation should have prevented the missteps that have already occurred. Fountain Ave. is a street of variable width. There are three distinct areas between Western and Vermont with street width that ranges from 38' to 60' (approx) and with lane configurations that vary from traditional midblock to a variety of intersection treatments. This makes the LADOT's Bikeways Department's decision to place the Sharrows a consistent 12' from the face of the curb all the more dangerous. While the traffic lane on Fountain Ave. proceeds from one end to the other in a straight line, cyclists are directed by the Sharrows to follow a line that varies in distance from the center of the street, moving cyclists back and forth as the street narrows or widens. Urban Cycling education directs cyclists to pick a line and stay with it, communicating clearly to other road users with predictable behavior their intended destination. Yet the Sharrows are less than 7' from the centerline of the street in the study area and as much as 18' from the centerline of the street at the Vermont end. The Sharrows must be in a consistent position so that cyclists are integrated into the traffic flow, not inserted and then removed based on the variable curb position. The Sharrow pictured above is placed 12' off the curb to the right but it's 18' from the centerline of the street. This Sharrow is in the right turn lane, a travel lane used by right turning traffic accessing a side street and positioning the cyclist in position to become the victim of a Right Hooking motorist who will pass on the left in order to turn right. The correct position for the Sharrow is to the left, closer to the center of the street, positioning the cyclist with through traffic, allowing right turning traffic to pass the cyclist on the right and turn onto the side street. This Sharrow directs cyclists into the back of the parked cars ahead, or cyclists can veer to the left and enter the traffic lane as the street narrows, hardly an inspired engineering choice. Cyclists should be in the correct position in advance of this conflict point, the Sharrow needs to be moved to the left. This Sharrow is also placed 12' off the curb to the right but it's less than 7' from the centerline of the street. The orange circles indicate that this is one of the "study" Sharrows and that the behavior of motorists and cyclists in this area will be gauged to determine the efficacy of the Sharrows. Studying the impact of the Sharrows that are in the travel lane and ignoring the Sharrows that are outside the travel lane is a study that will yield skewed results. This curious study may not gather much data on the impact of Sharrows on the behavior of cyclists and motorists but it certainly reveals a great deal insight into the LADOT's Bikeways Department's strategies, priorities, logic, and knowledge of urban cycling. This photo is looking back at Fountain at an all too common variable street width. The flow of traffic on the single lane in each direction is smooth but the addition of the Sharrows directs cyclists to move in and out according to the width of the street. The Sharrows should position cyclists in the correct position in the lane, not just a uniform distance from the curb. Bad for cyclists, bad for the flow of traffic. This photo demonstrates the importance of the "measure twice, spray paint once" mantra, demonstrating that even when the LADOT's Bikeways Department commits to placing the Sharrows a uniform 12' from the curb, they're just not up to the task. 12' is not always 12' the LADOT's Bikeways Department is doing the measuring. This is an easy enough mistake to make but on a bike, the misplaced Sharrows are easy to find. Cyclists know when they are moving back and forth and as we rode the street, even without measuring, we were able to pick the Sharrows that didn't "feel" right. Painting Sharrows on the street without surveying the larger environment and determining the best place for cyclists results in Sharrows that engineer conflict, directing cyclists into potholes, over sunken water main caps, and along the most worn line on the street (the right tire track of the motor vehicle traffic). Simply adding the consideration of the best street surface would result in the Sharrows being placed in the center of the travel lane which is also the best location for controlling the lane. Even better would be to coordinate with the Bureau of Street Services (they installed the Sharrows!) and prep the street so that local resurfacing projects and the implementation of the Sharrows program could be complementary. These Sharrows are in the center of the travel lane and they are supported by the R4-11 “Bicycles May Use Full Lane” Sign which reinforces the message that motorists need to hear. 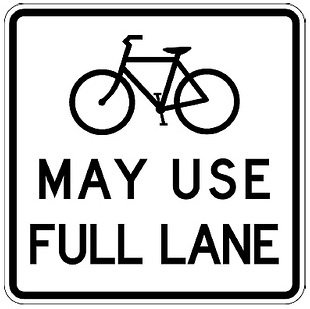 The correctly placed Sharrows are supported by the signage and together, they communicate clearly to cyclists and motorists the correct lateral lane position for cyclists on a travel lane that is too narrow to share side-by-side. These Sharrows are not in East Hollywood and the R4-11 sign is nowhere to be found on Fountain Ave. The City of Los Angeles would do well to check its "We don't take direction from the neighboring villages!" attitude and start looking around at the more agile and innovative communities that are consistently beating LA at improving the quality of life for their residents, their road users, their businesses, their visitors and their voters. Long Beach spent 4 weeks planning their Sharrows project and they ended up picking up an Innovation Award from the Institute of Transportation Engineers. 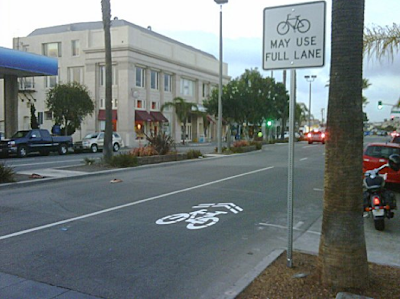 Manhattan Beach reportedly spent a mere $2K on their Sharrows but complemented that meager investment of funds with maximum professional implementation and fastidious attention to detail, drawing compliments from even the hardiest of transportation critics. Effective solutions do not need to be complicated or expensive, sometimes simply executing well is a significant step in the right direction. 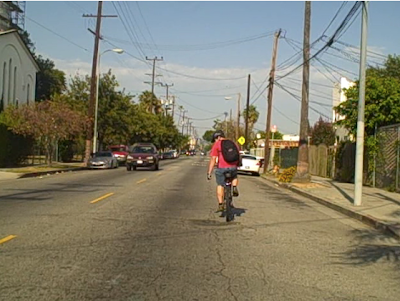 As for Los Angeles, it's not to late to salvage the floundering Sharrows project. The best place to start would be to engage the critics, involve the constituents, draw in the advice of the Caltrans Bicycle Advisory Committee and LA's Bicycle Advisory Committee, and invite the community to participate in the process. Relying on advocates who are on the clock is the simplest way to get applause from the choir but it is hardly the formula for creative and constructive criticism. Most important, go ride a bike. Ride through Long Beach, ride through Manhattan Beach, then ride down Fountain Ave. The street looks a lot different when viewed from a bike. The LADOT's Bikeways Department just blew their biggest opportunity at relevance by misplacing LA's first official Sharrows, revealing an LADOT adherence to the mythology of "Ride to the Right" cycling instead of the safer and more effective "Ride Where it's Right" mandate. News that Sharrows were actually going down on East Hollywood's Fountain Ave. prompted tweets of celebration and blog posts memorializing the long overdue implementation of the simple street marking that is meant to direct cyclists to the correct lane position and alert motorists to the appropriate location for cyclists. Unfortunately, the news was tempered by the revelation that the LADOT Bikeways Department failed to place the Sharrows in the correct position. 1) Reduce the chance of bicyclists impacting open doors of parked vehicles on a shared roadway with on-street parallel parking. 2) Alert road users within a narrow traveled way of the lateral location where bicyclists ride. 3) Be used only on roadways without striped bicycle lanes or shoulders. Fountain avenue is a narrow roadway with parking on both sides and one lane of traffic in each direction. The street is approximately 40' wide allowing for 8' of parking lane and 12' of travel lane. The Sharrows are positioned a consistent 12' from the curb face, meaning that the right edge is 10'4" from the curb and the left edge is 13'8" from the curb face. This position if incorrect for the following reasons. 1) The current position does not direct cyclists to the correct lane position in order to avoid the door zone. The correct position for a effective Sharrow would then be 8' for the parking lane plus 5' for the door of a Suburban for a curb face to Sharrow centerline distance of 13'. 2) The current position does not direct cyclists to the correct position for a non-sharable lane. At 12' in width, Fountain Ave. is non-sharable for a motorist and a cyclist, meaning that a cyclist should "control" the lane by riding in the center of the travel lane, in between the tire tracks of the motor vehicles. The correct position for the cyclist and for an effective Sharrow would then be in the center of the travel lane which would then be 8" for the parking lane plus half the travel lane of 12' for a total of a curb face to Sharrow centerline distance of 14'. 3) The current position does not alert motorists to the correct lane position of cyclists and instead communicates that on a narrow lane, cyclists belong to the right and out of the way of motor vehicle traffic. This is incorrect and dangerous, encouraging motorists to drive side by side with cyclists, even when there is no room. While other cities have moved quickly to place Sharrows (a simple roadway marking that communicates correct lane position to cyclists and alerts motorists to the appropriate integration of cyclists into the traffic mix) on their streets, Los Angeles has taken its time, lots of time, so much time that one would think that the resulting program would be worthy of the years of debates, research, planning, fine-tuning and funding but such was not the case. This past Friday the LADOT, the Bureau of Street Services, and the Los Angeles County Bicycle Coalition were all joined by City Council President Eric Garcetti in what should have been a defining moment, the advent of a new era of traffic engineering for Los Angeles that facilitates and supports safe and effective cycling as a valid transportation choice but such was not the case. Granted, lots of Sharrows were laid down on Fountain Ave., between Western and Vermont, directing cyclists and alerting motorists and demonstrating the unique City of LA support for cyclists that has prompted Bicycling Magazine to refer to LA as a city with "great potential for biking." Lots of promise but not much in the way of results. LA's Sharrows program didn't happen overnight, it came into existence with a great deal of struggle, relying on community support, regional planning (SCAG) support, planning consultant (Alta Planning) support, private foundation (Bohnett Foundation) support, neighborhood council (EHNC) support, and city council (Garcetti/Rosendahl) support. All of which makes it harder to understand how the simple placement of the Fountain Ave. Sharrows could go so wrong, yet that's what happened and it is significant for several reasons. 1) It demonstrates the complete ineptitude of the LADOT's Bikeways Department. 2) It jeopardizes LA's nascent Sharrows program by engineering conflict and positioning the project for failure. 3) It establishes a standard for mediocrity that sets the course for the implementation of future engineering innovations. 4) It damages relationships, betraying the confidence of the City Council President, the Southern California Association of Governments, the Bohnett Foundation, the East Hollywood Neighborhood Council and LA's cycling community. 5) It squanders precious resources at a time when the City of LA can least afford it, all on a simple project that now moves forward with an inflated pricetag and limited efficacy. The issue of the misplaced Sharrows is simple, Fountain Ave. is a narrow local street with on-street parking and one lane of traffic in each direction. There are abundant driveways on the short stretch between Western and Vermont, each one representing a conflict point that cyclists should avoid. In addition, the street has some potholes, nothing new in LA, but each one representing an obstacle that a cyclist should also avoid. The narrow width of the travel lane (12') and a cyclist's need to control the lane to prevent motorists from squeezing by on the left are all indicators that the correct position for a cyclist on Fountain Ave. is in the center of the travel lane, between the tire tracks of the motor vehicle traffic. 1) Ignore the placement of the Sharrows and "Ride Where It's Right" but incur the wrath of the motorists who expect cyclists to follow the position of the Sharrow? 2) "Ride to the Right" and give up control of the lane, getting squeezed by motorists on the left, watching doors on the right, all while invisible to motorists exiting the adjacent driveways? 3) Evaluate the LADOT Bikeways implementation of the Sharrows program and objectively measure it against successful programs, further alienating a city department that has long ago given up any pretense of benefiting the community it purportedly serves? 4) Lower the standard and accept mediocrity as the Sharrows program standard and prepare for the further implementation of ineffective and unsafe Sharrows? There are many who will argue "You know, they don't look that bad!" In fact, the LADOT's implementation partners have already circled the wagons, looking for examples elsewhere of Sharrows that are even closer to the curb line. None of which is responsive to the basic charge, that the Sharrows are too far from the left and that they move the cyclist out of correct lane control position. The centerline of the Fountain Ave. Sharrows are 12' from the curb face, 11' is the minimum. At issue here is not the distance from the curb (although it is a problem) but the distance from the centerline of the street. The edge of the Sharrow is ~7' from the center of the street, just enough distance to allow a motorist to think that squeezing through is acceptable. It isn't. The best way to avoid getting squeezed is to control the lane which would put the cyclist down the center of the lane, not to the right. Saddest of all is the simple fact that apologists for the LADOT Bikeways Department would consider offering the "Not that Bad!" argument for the Fountain Ave. Sharrows while a city such as Long Beach rallies around their battle cry of "The most bicycle friendly city in the country!" Charlie Gandy, Mobility Coordinator for Long Beach and the force behind the award winning Green Lane Sharrows, says "If the street isn't 14' then it needs to be shared one in front of the other, not side by side, it's all about safety." Charlie refers to the correct Sharrow position as being in the center of the lane and believes that Sharrows should be an invitation to ride, not an instruction to get out of the way. John Fisher, Assistant General Manager of the LADOT and a member of the National Committee on Uniform Traffic Control Devices and of the California Traffic Control Devices Committee, referred to the positioning of the Sharrows as a Bikeways Department decision but pointed out "From a maintenance standpoint, it would be more effective to put them in the center of the lane so they last longer." David Bell, President of the East Hollywood NC, said "It would be great to celebrate the arrival of the Sharrows in East Hollywood but unfortunately, the failure to properly implement the Sharrows Pilot Project demonstrates the need for standards and professional oversight." Michael Bluejay, in his excellent "How to Not Get Hit by Cars" article, says "if you ride to the right, someone exiting a parked car could open their door right in front of you, and you'll be less visible to motorists pulling out of driveways and parking lots, and motorists coming from behind may pass you way too closely in the same lane because you didn't make them change lanes." Ron Durgin, President of Sustainable Streets and a LAB Certified Instructor, says a cyclist's first responsibility is their personal safety and that maintaining a confident and consistent lane position is an important technique for controlling the lane and for communicating with other road users. "If the lane is 13 feet wide or narrower, it's generally not shareable and you're best off claiming your legal right to the entire lane. If you give cars the space, the average driver will take it and then you get squeezed," he says. Dan Gutierrez, League of American Bicyclists instructor and creator of the Cyclist View training program has developed extensive materials that all demonstrate that importance of good lane positioning as a basic tool for the most safe and effective integration of cyclists into the traffic mix. Dan calls for Sharrows at a minimum of 13' from the curb face and also considers the resulting lane position as a mitigating factor when positioning Sharrows. Attached is a Door Zone diagram that demonstrates 13' as the minimum centerline position for cyclists. This simple event on the streets of East Hollywood is reminiscent of the story of the Scorpion and the Frog. In the tale, a scorpion and a frog meet on the bank of a stream and the scorpion asks the frog to carry him across on its back. The frog asks, "How do I know you won't sting me?" The scorpion says, "Because if I do, I will die too." The frog is satisfied, and they set out, but in midstream, the scorpion stings the frog. The frog feels the onset of paralysis and starts to sink, knowing they both will drown, but has just enough time to gasp "Why?" The scorpion replies, "It's my nature..."
The LADOT's Bikeways Department (the Scorpion) has a horrendously poor track record for the successful implementation of bikeways projects and programs in the City of Los Angeles, laying down 1 mile of bike path, 4 miles of bike lane and 0.5 miles of bike route per year for the last 15 years. Why would the cycling community (the Frog) trust Bikeways to properly implement the Sharrows program? Because, logic would dictate that Bikeways can't fail the cycling community without failing the LADOT. The public, like the Frog, was satisfied. Yet, the LADOT's Bikeways Department delivered another stinker, just like the long overdue Proposed Bike Plan, just like the Topanga Canyon Bike Lanes, just like the dormant Bike Parking program. The LADOT's Bikeways Department is big on talk, bigger on attending daytime meetings, much bigger on reports and analysis and studies, but grossly disappointing when it comes to delivery. Based on results, often harsh but always fair, the LADOT Bikeways Department has a legacy of failure. "Why?" The LADOT Bikeways Department replies, "It's my nature..."
The LADOT's Bikeways Department is not part of Operations. It is part of Capital Funding. It's purpose is to fund, not implement. Look at the $1.25 million that was secured by Bikeways as funding for cycling improvements on the Fletcher Bridge. Once the money was awarded, the Bikeways Department went to work moving the money to a different bridge widening project. The cycling community of LA serves as a funding source, not as a constituent group served by the LADOT. Bikeways serves as a funding tool, it exists in order to fund its existence. The first Sharrow installed in Fountain leads cyclists directly to the upcoming pothole, one of many that lie along the right tire track of the motor vehicle traffic, another reason to move the Sharrows so that they position cyclists in the center of the lane, not the right side. 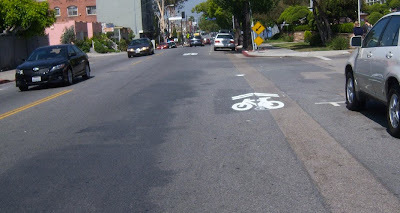 At the end of the day, these Sharrows belong to the people of Los Angeles. So do the streets themselves. And yet, somehow, the LADOT's Bikeways Department, Alta Planning, and the LA County Bicycle Coalition have managed to work together for a significant amount of time, avoiding the public process on the actual placement of the Sharrows (not just the streets but the actual position on the street) and without the oversight of the Caltrans 7 Bicycle Advisory Committee or the LA Bicycle Advisory Committee or the public in general on the placement of the Sharrows. When the campaign coordinator for the LACBC was asked how the decision on the location for the Sharrows was made, she said didn't know who made the decision on the location nor did she know how it was made. Is the LACBC simply hired as a bikewashing cover for the same old ineffective LADOT Bikeways behavior? Welcome to Los Angeles, the city where "almost" is not only an engineering standard, it's an acceptable performance standard for city staff and it's our current status as a Great City. CityWatchLA - NC Elections: Opportunity that Got Away! 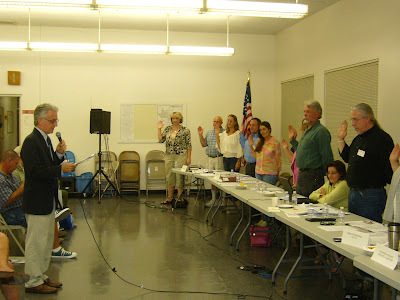 One of the most significant events in the life of a neighborhood council (along with all of the others) is the election of the Board of Directors, an occasion that is much more than the simple selection of the chosen few. The election is also the most significant outreach event in the NC cycle, offering an opportunity to not only engage qualified candidates but to engage the community in the work of the council. The election also offers the community the opportunity to participate in establishing a vision for the council, during the campaign journey and at the election itself. Neighborhood Council elections have become a spectator sport, one that takes place in an abstract fashion with little ownership from the many groups who purportedly have a vested interest in the outcome. Consider the role of the Department of Neighborhood Empowerment in the election process and their laissez faire attitude to the process. Granted, they are no longer responsible for conducting the actual elections but one would think that they would have a vested interest in promoting the NC mandate, the NC system, the NC engagement. If nothing else, one would think that DONE would have used the NC election process to promote themselves, demonstrating their ability to communicate, to connect, to engage the community and to support the NC system. Such is not the case. DONE is, at best, a passive spectator to the NC election process, at worst, they are completely oblivious. Consider the neighborhood councils, caught in the middle of a long drawn out battle over roll-over funds and funding debates and also caught in the middle of a long drawn out battle over election authority and responsibility. Some councils had a strong track record of outreach and they faired well. Some councils had a history of relying on DONE and they were left hanging. Some councils failed to grasp the importance of the election process and simply allowed it to be something that was done to them, not for them and certainly not with them. The final results remain to be seen but as the election process limps forward, it seems to be leaving many councils floundering in its wake. Consider the role of the City Clerk, currently responsible for conducting NC elections but not responsible for any outreach or communication other than that specific to the machinations of the actual election process. As the City Clerk nears completion of the citywide neighborhood council board election process, they have received cheers from some and jeers from others, along with a great deal of ambivalence, resulting in City Council assurances that the entire process will be reviewed for efficacy and efficiency. Along the way, the City Clerk claimed absolute authority over elements ranging from bylaw revisions to election procedures to the grievance process. With this authority comes only limited responsibility and it ends at the moment of certification. The failure of the Department of Neighborhood Empowerment, the Neighborhood Councils and the City Clerk to come together with a citywide plan for capitalizing on the election process as the single greatest opportunity to connect with the community and to promote the neighborhood council system is a huge missed opportunity. This failure to come together has also left a gap in accountability that leaves some neighborhood councils in limbo, attempting to play by rules but unable to locate any authority. At issue is the process for transitioning neighborhood council authority from the sitting board to the newly elected board. For many, the composition is similar so the transition is of minimal impact and significance. In other cases, the old board is being replaced by a new board. That has proven to be a problem for some councils. First, what agency or department has authority over the seating of the new board? The City Clerk is responsible for certifying the elections and then new board members show up at the next regularly scheduled board meeting, only to find that the City Clerk is gone, Neighborhood Empowerment no longer attends NC meetings, and there is some confusion over what authority facilitates the process. One NC floundered as they waited on the the results of an election grievance and the certification of the election, only to find themselves in limbo as the time came for the new board to be seated. Two months had gone by, the old board had moved on, the new board politely waited for a determination on who seats the new board? Second, under what authority does the new board take its seats and the resulting authority over council business? According to the City Clerk generated Election Procedures, once the election results are certified, the old board convenes the next regularly scheduled board meeting and is responsible for seating the new board. Typically, this is painless but in some cases it has been a problem. One NC had no quorum of the old board but simply took a quorum of the new board as legitimate authority to seat the new board and to proceed with NC business. What message does this send to new board members is the first thing they learn is that the quickest way to conduct NC business is to look for “workarounds” in order to navigate LA’s bureaucracy. Third, what agency or authority is responsible for any appeals or claims of inappropriate board activity? One NC had its elections certified but the outgoing Board President chose to fill the unfilled seats by appointment before passing the gavel. The newly elected board showed up at the regularly scheduled meeting but they weren’t seated and the gavel wasn’t passed. Another lost opportunity and another bad lesson for the new board members. Through it all, some City Councilmembers have partnered with their neighborhood councils, facilitating neighborhood council board transitions by honoring the outgoing boardmembers and recognizing them for their contributions, by recognizing the election results and honoring the stakeholders for their participation, and by swearing in the new board and offering their partnership in the impending journey. It's good to have friends, especially in high places! But this was the exception, not the norm. Ultimately, the limbo period is a huge problem for neighborhood councils because of the impending deadline for NC budgets for the upcoming 2010/2011 year. How can an NC effectively engage the community and plan for the upcoming year if they can’t find the gavel and seat the incoming board? This failure to anticipate the conflict between the individual NC bylaws and the City Clerk election procedures was discussed at the beginning of the transition process and dismissed as a simple procedural necessity. For DONE? For the City Clerk? Certainly not for the neighborhood councils! This failure to anticipate the limbo zone between the City Clerk and the DONE is indicative of the lack of foresight that NC’s have experienced with literally every decision that has come from City Hall. From funding issues to staffing issues to the elections to the CDD/DONE consolidation, it is apparent unintended consequences are the greatest threat to LA’s neighborhood councils. This failure to anticipate the need to address board transitions has prompted calls for help, so many that the DONE employee on the “Help Line” acknowledged that “There have been a lot of calls on this issue.” This begs the question, “What good is the ‘Help Line’ if a large number of questions don’t motivate DONE to address the need for information? The lesson to be learned from the current neighborhood council experience is that neighborhood councils are on their own, that their effectiveness is dependent on their initiative and on their resourcefulness, and that the future of the neighborhood council system requires immediate action from the community, not from City Hall. City Hall’s best shot for survival consists of heeding the call of the wild and looking to the natural world for inspiration, a strategy that will position LA to not only survive the current budget crisis but to emerge from the battle ready to take its place as a Great City. LA’s Mayor and City Council would do well to look at the unbending rules of nature and to imitate the time-tested sustainable behavior of the those who have gone through worse and have still prevailed. *Nature thrives on diversity. LA’s City Hall is filled with fruit from the “yes” tree and rubber stamping commissions, reinforcing incestuous behavior and the magnification of weakness. LA must embrace its human infrastructure and celebrate the rich and vibrant wealth of talent that makes LA the richest city in the world. *Nature rewards specialization. LA’s Mayor touts LA as the “cultural capital,” the “Greenest Big City,” the “Undisputed Creative City,” the “Biotech Capital,” the “Eco-Fashion Capital,” the “Solar Capital,” and the “Green Technology Capital.” Along the way, the titles that LA actually accumulated are in Homelessness, Foreclosures, Unemployment, Traffic Congestion, Failing Infrastructure, Budget Shortfall and Disappointment. LA must pick something, stick with it, and become the Capital of (insert something BIG that draws on LA’s unique challenges) setting a Great City standard and charting the long-term course for comprehensive municipal recovery and dominance. *Nature loves transparency. LA’s Predators share the same watering holes as LA’s Prey, artfully seducing them with promises of immense comfort, protection, and long careers. They look alike, they sound alike, they smile and act professionally. They’re not here to serve the people of LA. They’re the Predators. Lobbyists, Developers, Fixers, Handlers, Consultants, and Contractors alike must be required to conduct their business while wearing the appropriate stripes, spots, patterns, plumage or rattlers, so that there is no mistake when a Predator is in vicinity. *Nature operates systemically. LA’s unique balance of power is “provincial” at best and the Mayor and the City Council squabble just enough to set the tone for the 45 City Departments and Bureaus who go along to get along, all the while building silos for protection. *Nature rewards groups. LA’s community infrastructure is its greatest asset and yet the notion that communities should be supported and that regional organizations should be embraced is still treated as a novelty. Constituents groups in packs, swarms, mobs, and prides indicate health, not a threat to the Lords of the Manor. LA’s Neighborhood Council system must be supported with the full force of the Mayor and the City Council. Connecting the people of LA with their City and with their neighbors will only edify Los Angeles. Resistance comes from those who thrive on the status quo and who fear progress. *Nature loves information. LA’s data infrastructure is sorely outdated and in dire need of an overhaul. 45 Departments and Bureaus each have their own protocols, collectively unique enough to isolate us from our neighboring municipalities, from the County, and from the State. Los Angeles actually asks its partners to “dumb down” their communications in order to connect to LA. Smart Cities react in real time to data that announces predictable events and everything including emergencies is predictable. Know what to monitor, pay attention, act accordingly. Soon! *Nature keeps improving. LA’s legacy is the ability to commit the same mistakes over and over, never learning from them but always hoping that the sheer size of LA will allow for the rules to be bent. Sometimes it works, temporarily, but it often fails. LA’s ability to take its place as a Great City depends wholly on its ability to commit to a long-term plan for survival that demands consistent evaluation and improvement, not simply the continuing avoidance and postponement of catastrophe or collapse. *Nature right-sizes. LA’s ability to rationalize failure is exceeded only by its ability to fail. When funding presents itself in bulk, LA’s leaders have actually sat at the table and explained that “We didn’t have the staff in place to spend the money and we didn’t notice for two years.” LA is lean when it should be fat, LA is fat when it should be lean. LA must look to other larger cities to determine an effective strategy for matching the needs of the city with the size of City Hall. Larger cities thrive so its not simply size, its the right size at the right time in the right place. LA must get it right. *Nature thinks long term. LA’s Mayor and City Council plan for the duration of their terms and for their next campaign. They are currently very busy consuming LA, exploring every means possible to increase fees, raise rates, bump penalties, add licenses, and otherwise extract more money from the people of Los Angeles. At the same time, the city’s physical infrastructure decays as maintenance and repairs are further curtailed while anything of value has already been appraised and buyers are being courted. LA’s course must be charted by those who are committed to LA’s future, not those who are already packed and ready to head off to political office elsewhere, leaving LA to pay off their debts. *Nature rewards good stewardship. LA’s City Hall is where is starts, literally. The people of LA must grab City Hall by the recycling bin and address the gross inefficiencies and underutilization of its resources, establishing a standard for the City Departments and for the City of LA. LA will take its place as a Great City when it is led by good stewards, people who are committed to being resourceful, productive, and faithful as they turn waste into wealth. 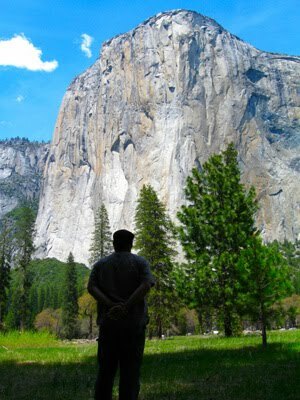 Last week, Enci and I spent a few days in Yosemite National Park, a familiar experience that is always daunting and overwhelming, as if for the first time. At every turn, we were reminded by park management of our responsibilities as guests and as stewards. Most of all, we were impressed by the hugeness and awesomeness of nature as we walked along the waterfalls, as we hiked through the woods, and as we stood quietly under a star-filled sky and experienced millions of years of balance and perfection. Los Angeles is no different. It is a huge and awesome city that is bigger than any one person but totally dependent on our collective service and good stewardship. LA exists for our benefit and it is our responsibility to serve the City as good stewards; anything less would be unnatural. It’s been a little more than three weeks since Enci sent the tweet heralding the arrival of Trader Joe’s in Hollywood but lamenting the fact that it would be sans Bike Racks. The Tweeps responded, the news spread through the Facebook crowd, and Trader Joe’s started getting phone calls. Lots of them. It would seem that convenient, safe, and effective Bike Parking would be the norm, not the exception but such was not the case and so the battle unfolded, with Enci calling for a boycott and Trader Joe’s playing dumb. Trader Joe’s, like any large company, organization, bureaucracy, has mad skills in the fine art of the “Anyone but me!” line of defense when dealing with the public, the customer, the stakeholder, the reason for their existence. They went to work. 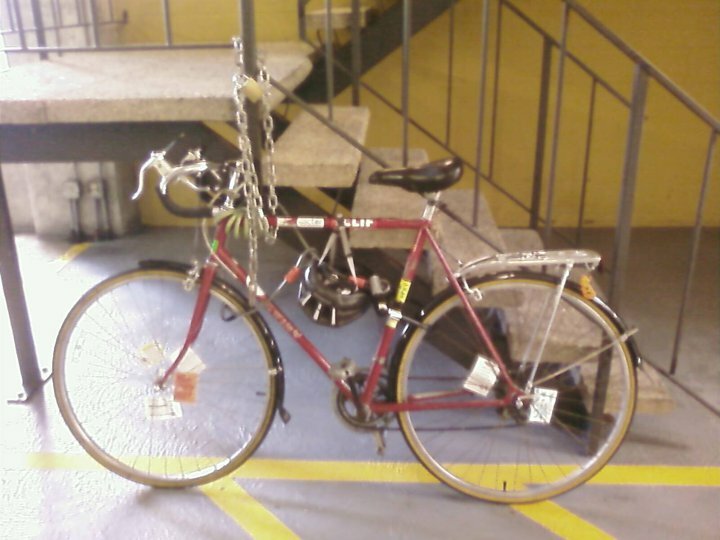 They started by blaming their failure to provide Bike Racks on the City of LA, claiming that it required a permit and that it would be completely inappropriate to put bike racks on Vine, in front of the building. I pointed out that it was not true. They then shifted the responsibility to their Landlord, Legacy Partners, saying that it was the developers responsibility to put in Bike Racks, not theirs. I again pointed out that it was not true. I spoke to Legacy Partners, attempting to remove any obstacles, and was informed that Bike Racks on the street would be a problem for aesthetic reasons. I pointed out that the building would look a lot nicer if it was surrounded by people, bikes, signs of life! Legacy then changed tack, claiming that their Development Agreement with the Metro and the CRA forbid Bike Racks. I pointed out that it was not true. I spoke to the Metro, they had no prohibition against Bike Racks and unfortunately, they also had no requirement in the Development Agreement for Bike Racks. I spoke to the CRA, they had no prohibition against Bike Racks and, again unfortunately, they had no requirement in the Development Agreement for Bike Racks. I spoke to LA’s City Council President Eric Garcetti, pointing out that LA’s largest Transit Oriented Development opened with no Bike Racks, all in violation of LAMC 12.21-A16. He smiled and said that they had a great plan for centralized bike parking somewhere else on the W Hollywood’s four and half acre lot. I pointed out that it was not true. Somehow LA’s largest Transit Oriented Development made it all the way to the finish line with no Bike Parking standard in place for tenants, even though the City of LA requires it. Somehow the Metro, the CRA, the City of LA, Gatehouse Capital and Legacy Partners are able to put Federal, State, County, City money to work developing the neighborhood, yet do it with complete contempt for the people who don’t arrive in a motor vehicle. It’s been two weeks since the TJ’s in Hollywood opened, it’s been two days since Director of Construction installed the Bike Racks. They look great and they are a victory for a few reasons. *We’ve established a Bike Parking standard for the Metro and for the CRA. Transit Oriented Development must have a Bike Parking standard for the project as a whole and for the tenants. Centralized Bike Parking is a non-starter, a figment of Garcetti’s imagination, implausible, unacceptable, a simple violation of the “convenient and practical” rule that governs design. This is not the first time Enci has tangled with the City or with Property Managers over Bike Parking. There was the City National Plaza and their threat to impound bikes, there was the Museum Square incident that saw her bike booted and there was the successful Bike Rack campaign at LAPD Headquarters. More than 90 thousand people have visited YouTube to view the 91 second video of the LAPD arresting cyclists on Hollywood Boulevard this past Friday night, a video that was shot on an iPhone by a cyclist who was then tackled and cited for his efforts, prompting charges of excessive force against the LAPD. 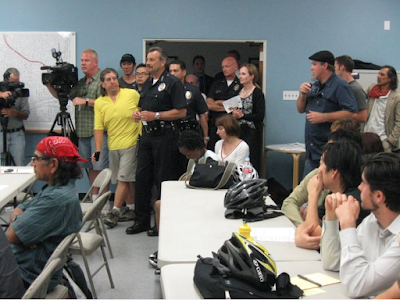 Chief Charlie Beck wasted no time in responding to the allegations, attending the regularly scheduled bi-monthly meeting of the Los Angeles Bicycle Advisory Committee to address a standing room only crowd, assuring the audience that the he has "taken immediate action based on information received from this community." As of Tuesday's LABAC meeting, four officers had been removed from patrol duty and reassigned within the station to duties that did not involve interaction with the public. Chief Beck asked for time, but offered his assurance that the patience of the community would be rewarded, offering up that the very nature of police work involved inevitable conflict but that the true test was how it was resolved. He committed to a transparent process and to employing the Cyclists/LAPD relationships that he had worked to develop since taking over as Chief. The timing of this incident could not have clashed more with the incredible recent success of the Cyclists/LAPD Task Force, coming on the heels of the development of an online LAPD training program along with the release of LAPD Policies and Directives that support cyclists on the streets of LA. At the same time, it was the relationships developed during the last six months of work that allowed the community to reach out on a holiday weekend, calling on Sgt. Krumer, Commander Villegas and Assistant Chief Paysinger to grab hold of the incident before it got swept away. Supporting Chief Beck was a full complement of LAPD heat, including Assistant Chief Debra McCarthy and Commander Andy Smith of the LAPD's West Bureau along with a Lt. and two Detectives from Internal Affairs. LAPD's Inspector General, Nicole Bershon, was in attendance with staff and made herself available to cyclists involved as victims or witnesses to the Friday evening incident. Cyclists who were on the Critical Mass ride offered their perspectives as victims and as witnesses. One young cyclist read the statement of his friend, the 15 year-old who spent 40 minutes in handcuffs for not having ID and was then joined by his mother, school teacher Jenny Swan, who spoke of her desire to support cycling on the streets of LA and asked the LAPD to join her in making LA "The City with the solution!" As a member of the Cyclists/LAPD Task Force, my initial reaction is to fear that the great work we've accomplished in developing relationships and policy will be set back by this incident but my initial experience allays that fear, instead confirming that we're on the right track and that we'll come out of this in a better place, with better relationships, and with stronger policies. *The Cyclists/LAPD Task Force has met five times since Chief Beck was confirmed and at the first meeting the LAPD was presented with a call to action on several issues including the cuffing policy and the pursuit policy. Now is the time to firmly address not just the incident that took place on Friday evening on Hollywood Boulevard but to address the larger opportunity to establish a policy on cuffing and pursuit of cyclists. The LAPD must establish clear guidelines and a policy on the use of handcuffs when stopping a pedestrian, a cyclist, or a motorist on the streets of Los Angeles for minor infractions such as crosswalk violations, lights, rolling reds, and for simple interviews. The LAPD must document the use of handcuffs, demonstrating that the use of handcuffs is based on clear criteria, not on bias-based policing. The LAPD must do comprehensive research on appropriate and inappropriate methods for instructing cyclists to stop, and stopping cyclists who do not stop. Based on that research, and on public input, LAPD must establish a policy for instructing cyclists to stop and stopping cyclists. LAPD must train its officers in these methods. The LAPD must clearly establish and implement a policy on addressing public assemblies, one that purportedly exists but that seems to disappear when the assembly consists of cyclists. To judge individuals based on the behavior of others is bias-based policing and it has no place on the streets of Los Angeles. If an LAPD Officer witnesses a motorist running a red light and speeding away, that does not give the LAPD the right to stay at the intersection, using force to detain the next motorist to pass. Further, to suggest that cyclists were violating the law will never be an acceptable argument or a justification for LAPD actions when THOSE actions violate the law. To examine LAPD behavior in the context of “The cyclists started it!” is a non-starter. The LAPD is here to hold us all accountable to the law but they aren't above the law and they are never in a position to violate the 1st and 4th Amendments. A 91 second YouTube video of the LAPD responding to Hollywood Boulevard cyclists riding on Friday night’s Critical Mass ride has stirred charges of excessive force and calls for an investigation of the LAPD’s deployment, making a simple bike ride the most significant traffic incident of the Memporial Day Weekend. Cyclists gathered early on Friday evening for the traditional monthly Critical Mass ride, riding the streets of LA in a “We Are Traffic” celebration that took them to the BP Gas Station on Beverly for a Gulf Oil Spill protest and then on a meandering ride through the streets of Los Angeles. 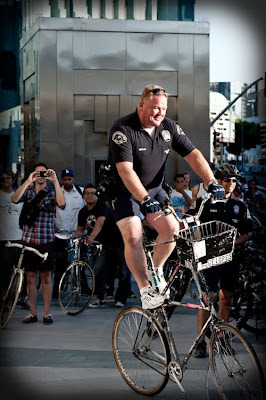 As the cyclists rode through different LAPD jurisdictions, they encountered different responses from the LAPD patrol officers, ranging from hoots and honks of support to indifference to their experience on Hollywood Boulevard which resulted in the YouTube video documenting the tail end of an incident that is positioned to rock the LAPD and the progress that has been made by the Cyclists/LAPD Task Force. 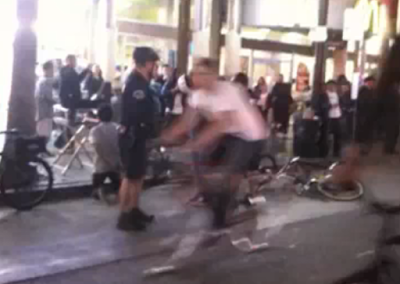 The LAPD response and actions on Hollywood Boulevard as the cyclists rode through the area. The LAPD response and actions on Hollywood Boulevard as the photographer documented the arrest of a cyclist. The failure of the Hollywood LAPD Watch Commander to take a telephonic request for an investigation or to take a complaint. *This incident and the resulting investigation is a defining moment for the LAPD. It comes on the heels of significant progress and in the midst of challenging times. Chief Charlie Beck made LAPD's relationship with the cycling community a priority when he was confirmed, forming the Cyclists/LAPD Task Force to take on policy and speaking affirmatively of the rights of cyclists. The Cyclists/LAPD Task Force has worked hard to develop training materials and policies that clearly articulate the rights of cyclists on the streets of LA. While great progress has been made on many issues, two of the key cyclist proposed policies that were rejected addressed the handcuffing of cyclists for infractions and the LAPD’s policy for pursuing and subduing cyclists for traffic violations. Late at night, a cyclist and his girlfriend stop to witness another cyclist getting handcuffed and that prompts the LAPD to give the witness a pair of cuffs. His offense? Stopping to watch. Early in the morning, a cyclist on a tandem drops his boy off at school and then rides home, getting pulled over for a traffic violation and ending up in cuffs. His offense? Denying a traffic violation? *The larger issue it this; when the LAPD encounters a large number of cyclists on the streets of Los Angeles, they are charged with judging the individuals for the behavior of the group. In other words, if a cyclist runs a red at the beginning of the ride and draws the attention of the LAPD, it's the cyclists who arrive late that get the tickets. Consider the cyclists who were riding north on La Brea drawing the attention of the LAPD who arrived late but not too late to greet the straggling cyclists who ended up in handcuffs and with citations that were later withdrawn. They drew the wrath of the LAPD and were punished because they were apprehendible. Their crime? Not having bike licenses! Consider the cyclists riding through the Downtown area three months ago on a Critical Mass ride were enjoying the evening air and streets free of motor vehicles, save for the LAPD patrol car that came driving directly at them, scattering the cyclists and then using the fact that they were riding past the patrol car with open doors as justification for charges of disobeying a command. When did driving a patrol car toward oncoming traffic and endangering cyclists become a command? Their crime? Being large in number. The LAPD response? Threaten safety with motor vehicle. Look at Friday’s Critical Mass incident that reportedly had hundreds of participants yet it is apparent in the video that it was the stragglers that drew the wrath of the LAPD, ending up tackled, handcuffed and cited because they were...available? *As for the cycling community, the apparent distrust of the LAPD or lack of faith in the complaint process has resulted in a scattering of witnesses and victims but there are three opportunities for the community to engage in a dialogue on this and related issues. LA Bike Map is an online crowd sourcing tool that allows members of the community the opportunity to simply log on and record incidents on the streets of Los Angeles, from hit-and-runs to road rage incidents to road conditions that need attention. The Los Angeles Bicycle Advisory Committee meets on the Tuesday evening at 7pm and the LAPD will be there to discuss the Friday night Critical Mass incident with the public. Bikeside is LA’s only 501(c)4 Bike Lobby in Los Angeles. BikesideSPEAKS addressed many of the issues that have been raised during this Cyclists/LAPD incident on Hollywood Boulevard and cyclists can join Bikeside in lobbying for the rights of cyclists on the streets of LA. *The Cyclists/LAPD Task Force has met five times since Chief Beck was confirmed and at the first meeting the LAPD was presented with a call to action on several issues including the cuffing policy and the pursuit policy. Now is the time to firmly address not just the incident that took place on Friday evening on Hollywood Boulevard but to address the larger opportunity to establish a policy on cuffing and pursuit of cyclists. To judge individuals based on the behavior of others is bias-based policing and it has no place on the streets of Los Angeles. If an LAPD Officer witnesses a motorist running a red light and speeding away, that does not give the LAPD the right to stay at the intersection, using force to detain the next motorist he sees.